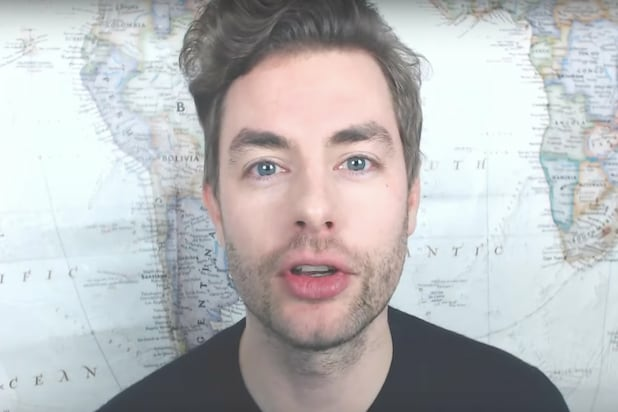 Paul Joseph Watson, the No. 2 star on Alex Jones’ InfoWars platforms, appears to have emerged mostly unscathed after a sweeping social media purge on Monday removed much of the company’s content from sites like Apple, Facebook, YouTube and Spotify. As of Tuesday morning, Watson remained active on both Facebook and YouTube, using both platforms to vehemently denounce actions taken by the social media companies to ban and deplatform InfoWars content. Watson, who describes himself as editor at large on InfoWars, was also untouched on Twitter — which remains the only major social media platform to have taken no action in the InfoWars purge so far. Watson has long been the company’s second most influential figure, with an audience often larger than Jones himself. As of this writing, Watson reaches more than 700,000 followers on Facebook, almost 900,000 on Twitter and more than 1.3 million subscribers on YouTube. Like Jones, Watson has a long history of propagating conspiracy theories to his millions of followers. In one YouTube video viewed more than six million times, he suggested then-candidate Hillary Clinton was suffering from brain damage. In this 2007 piece — now deleted — Watson and Jones suggested that the FBI was involved in the 1995 domestic terror attack in Oklahoma City that killed 168 people. Facebook, YouTube and Watson did not immediately respond to request for comment from TheWrap. Watson, with his distinctive British accent, has been a part of the InfoWars landscape for more than a decade and is most famous for his staccato monologues filmed in front of a map denouncing Islam, political correctness, pop culture and modern architecture. Watson has been affiliated with Jones since the age of 20, according to The Daily Beast, which reported that Jones’ ex-wife, Kelly has predicted Watson would ultimate supplant her ex-husband despite an often stormy relationship between the two men. The recent backlash against Megyn Kelly and NBC for interviewing Alex Jones has renewed the spotlight on the host of conservative show "Info Wars." Kelly said in a statement Tuesday that she wanted to interview Jones because of his ties with President Donald Trump. Here's a breakdown of their relationship. Trump and Jones began a relationship on Trump's campaign trail, and have peddled some of the same conspiracy theories, according to Mother Jones. Perhaps Trump's most popular conspiracy theory is that President Barack Obama wasn't born in the United States (he was), a theory also perpetuated by Jones. In December 2015, Trump was a guest on Jones' show. Jones introduced Trump as "a maverick" who "tells it like it is." Jones opened the show by praising Trump for taking attacks from media outlets like the Washington Post and the New York Post. Jones theorizes that the attacks on 9/11 were a hoax; it was surprising that a Republican candidate would go on a show whose host postures that the previous Republican president was part of such an elaborate hoax. At a January 2016 campaign event, Trump called Jones "a nice guy." In February 2016, senior policy advisor to Trump Stephen Miller appeared on "Info Wars," and repeatedly spoke to Jones' audience asking for support. "If you want to stop the Trans-Pacific Partnership, if you want to close the border, if you want to protect American jobs and wages, then you have to support Donald J. Trump," Miller said. "Hillary for prison" became the rallying cry at the 2016 Republican National Convention. The phrase was initially found on merchandise on the "Info Wars" website. Jones was a "special guest" at the convention. Trump continued to parrot Jones' ideas. Last August, Jones said, "It is surreal to talk about issues here on air, and then word-for-word hear Trump say it two days later." Also last August, Jones said on his show that he personally talked to Trump and encouraged him to push the idea that the election would be rigged. Trump did end up pushing this idea. "I'm afraid the election's going to be rigged. I have to be honest," Trump said at an Ohio campaign stop. In November 2016, Trump's advisor Roger Stone told the Washington Post that Jones would be a "valuable asset" to Trump. 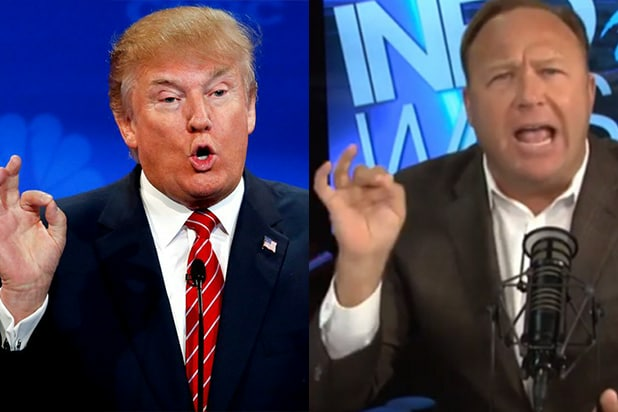 After the election, Jones said in an "Info Wars" video that Trump called him to thank him. "I wanted to talk to you to thank your audience," Jones said the then-president-elect told him. Even Hillary Clinton weighed in on Trump's reliance on Jones for ideas throughout the campaign, and released an attack ad featuring Jones. "This is what Trump listens to," says the ad as Jones talks about chemicals put in the water to make people gay. Jones' website is full of references to "presstitutes," and discredits news organizations like NPR and CNN. Trump is known for discrediting several news organizations. For example, in February he called the media "the enemy." Could Alex Jones’ InfoWars Face Gawker’s Fate With Multiple Defamation Lawsuits?